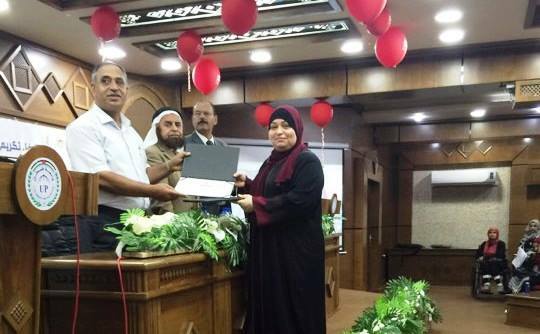 Aug 13, 2017 –The Higher Council for Innovation and Excellence (HCIE) honored Dr. Abeer Al-Qatati, Assistant professor of Medical Laboratory Sciences at the Faculty of Applied Medical Sciences, during the Second National Forum for Scientists in Palestine held in Ramallah. The Honoring came in recognition of her latest remarkable research "Determining levels of proteins contributing to the biological response of insulin and new insulin-like drugs". Her research is a complement to previous researches conducted to develop an effective chemical that will replace insulin injections in the future as an alternative treatment for diabetics. The chemical has proved its effectiveness in Dr. Al Qatati's researches in the USA. It is worth to mention that HCIE promised Dr. Al Qatati to support her research and present it to financers interested in pharmaceutical industries.